Tim Toivo obtained his M.Sc. degree in biomedical engineering at Tampere University of Technology 1996. He started his work at STUK–Radiation and Nuclear Safety Authority in 1998 as a scientist in the unit of non-ionizing radiation. Currently he works as a senior inspector and is mainly involved in regulatory, research and expert work in the area of safety issues of electromagnetic fields (EMF) and ultrasound. Part of his work is to inform users of EM fields and communicate with the general public about safety issues. He participated in the preparation of the EU directive (EU 2013/35/EU) as an expert for the Finnish delegation. He worked also on its implementation into national legislation as well as on guidance for Finnish workplaces in particular in regard to MRI workplaces. He has been involved over 15 national and international research projects and published over 50 articles from which over 10 in peer-reviewed research papers. Currently he is investigating if the cosmetic use of exposure to ultrasound has negative health effects. Research activities he has been involved in include the development of measurement techniques required to determine non-ionizing radiation exposure, as well as exposure measurements, particularly in relation to microwave radiation and various electric and magnetic fields. 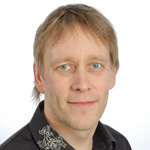 He has been lecturing non-ionizing radiation protection at the Tampere University of Technology since 1996. He was appointed a Member of the ICNIRP Scientific Expert Group (SEG) in February 2017.